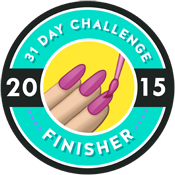 Today's post is a slightly bittersweet one as it's the final nail art linkup with the wonderful group of bloggers I've been collaborating with for the past 18 months for the Paint All The Nails linkups! Many of the group have (or will soon have) moved on from blogging into new adventures so today it's time to say goodbye. 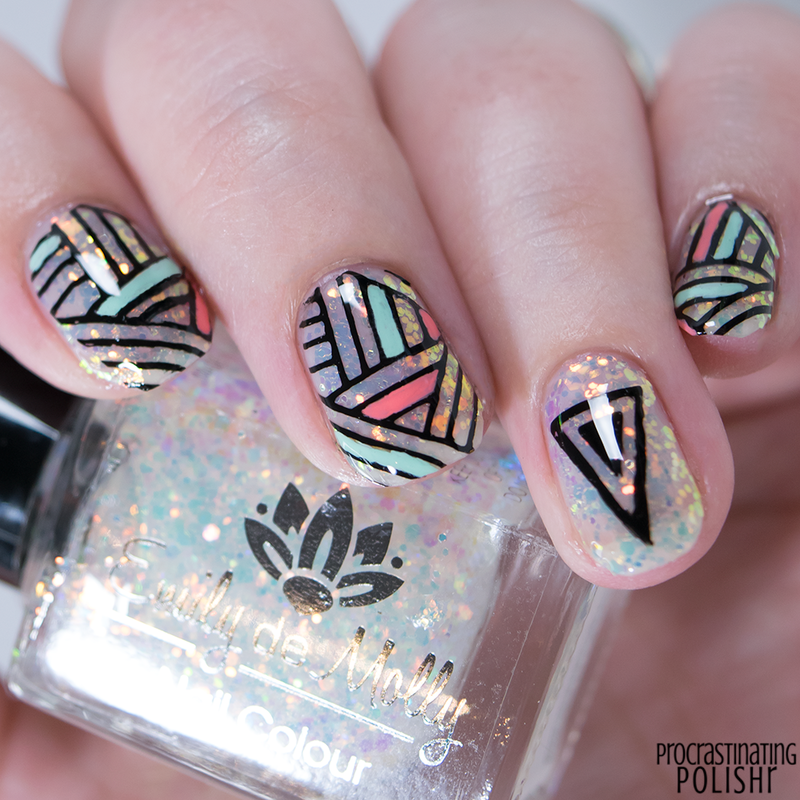 For our last hurrah we're recreating our favourite nail art from a past linkup - and it was truly a task trying to narrow it down to just one mani! 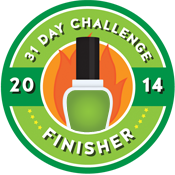 Seriously - check out the Pinterest board to get an idea of the choices I had to make. 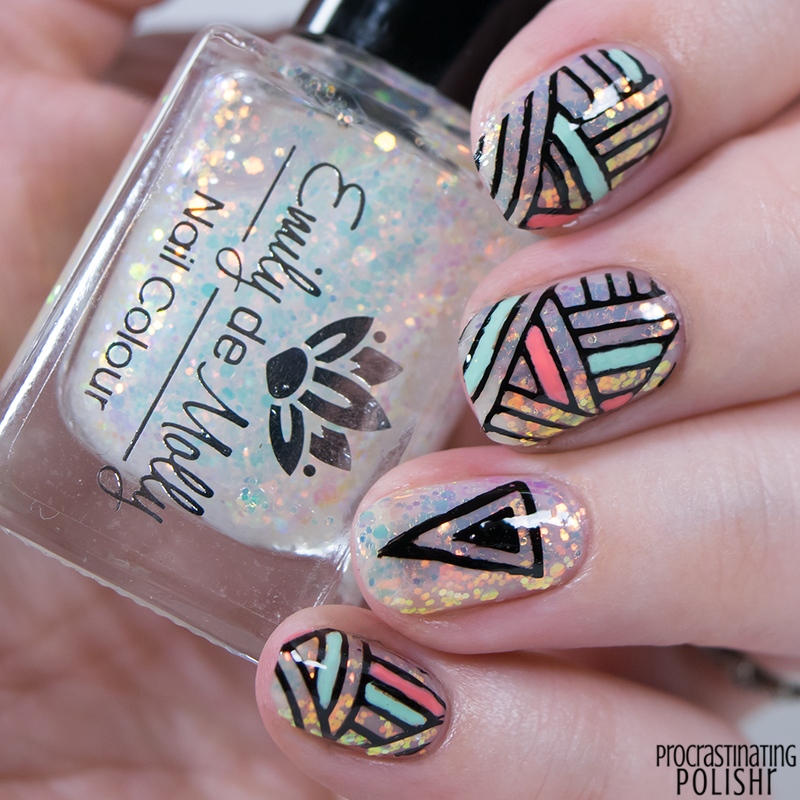 Ultimately the one I kept coming back to again and again was this gorgeous pastel geometric nail art by Emily over at Nail Polish Society. Though I couldn't recreate it exactly, I hope I managed to capture even half of the beauty of her original work with my recreation! I love the contrast of the bold black stamping over the wild sparkle of iridescent glitter, and the addition of some filled in spaces really made this something special in my eyes. I also thought it was quite fitting to end up choosing Emily, as she recreated my work last year for our Secret Santa linkup, so I'm returning the favour! To achieve this look I used two coats of All The Feelings from Emily de Molly, then stamped with MoYou Holy Shapes 01 with Powder Perfect Black Stamping Polish*. I filled in some random sections with a tiny trimmed down striper brush using Powder Perfect Florida* and Legend Says...*. I have not been able to stop staring at my nails since I did them. The glitter is mega sparkly - even in low light - and the little pops of green and coral give me all kinds of happy. To my lovely readers - I'm not going anywhere (#sorrynotsorry? ), and I hope you'll stick around too! Much like most of the world my 2016 has dissolved into a mess and I'm looking forward to hitting the reset button on January 1st. Now, for the final time, please make sure you check out all the amazing work in the links below and leave them some love! Disclosure: Products marked * were provided as press samples.